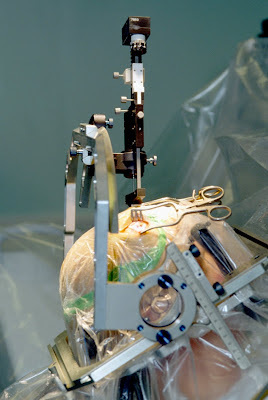 Insertion of an electrode during deep brain stimulation for Parkinson's disease. Deep Brain Stimulation (DBS) is a surgical treatment where a a patient is implanted with a medical device called a "brain pacemaker". The device sends out electrical impulses to specific parts of the brain. Deep Brain Stimulation in select brain regions has provided remarkable therapeutic benefits for otherwise treatment-resistant movement and affective disorders involving the brain and its functions such as chronic pain, Parkinson's disease, tremor and dystonia. DBS uses high-frequency electrical stimulation targeted to a predefined area of the brain. The patient is implanted with two thin wire electrodes, one on each side of the brain. The other end of each wire was connected under the skin of the patient's neck to a pulse generator implanted in the chest – similar to a pacemaker – that directs the electrical current. The U.S. Food and Drug Administration (FDA) approved Deep Brain Stimulation as a treatment for essential tremor in 1997, for Parkinson's disease in 2002, and dystonia in 2003. Mayo Clinic researchers have found a novel way to monitor real-time chemical changes in the brains of patients undergoing deep brain stimulation (DBS). The groundbreaking insight will help physicians more effectively use DBS to treat brain disorders such as Parkinson's disease, depression and Tourette syndrome. The findings are published in the journal Mayo Clinic Proceedings. Researchers hope to use the discovery to create a DBS system that can instantly respond to chemical changes in the brain. Parkinson's, Tourette syndrome and depression all involve a surplus or deficiency of neurochemicals in the brain. The idea is to monitor those neurochemicals and adjust them to appropriate levels. "We can learn what neurochemicals can be released by DBS, neurochemical stimulation, or other stimulation. We can basically learn how the brain works," says author Su-Youne Chang, Ph.D., of the Mayo Clinic Neurosurgery Department. As researchers better understand how the brain works, they can predict changes, and respond before those changes disrupt brain functioning. Researchers observed the real-time changes of the neurotransmitter adenosine in the brains of tremor patients undergoing deep brain stimulation. Neurotransmitters such as dopamine and serotonin are chemicals that transmit signals from a neuron to a target cell across a synapse. The team used fast scan cyclic voltammetry (FSCV) to quantify concentrations of adenosine released in patients during deep brain stimulation. The data was recorded using Wireless Instantaneous Neurotransmitter Concentration Sensing, a small wireless neurochemical sensor implanted in the patient's brain. The sensor, combined with FSCV, scans for the neurotransmitter and translates that information onto a laptop in the operating room. The sensor has previously identified neurotransmitters serotonin and dopamine in tests in brain tissue. This was the first time researchers used this technique in patients. Tremors are a visual cue that the technique is working; researchers suspect adenosine plays a role in reducing tremors. Researchers also hope to learn more about conditions without such external manifestations. "We can't watch pain as we do tremors," says Kendall Lee, M.D., Ph.D., a Mayo Clinic neurosurgeon. "What is exciting about this electrochemical feedback is that we can monitor the brain without external feedback. So now, we can monitor neurochemicals in the brain and learn about brain processes like pain." DBS has been used successfully worldwide to treat patients with tremors. However, physicians do not fully understand why DBS works in patients. They know that when DBS electrodes are inserted before electrical stimulation, there is an immediate tremor reduction. Known as the microthalamotomy effect, it is reported in up to 53 percent of patients and known to last as long as a year. Researchers hope to use the study findings to create a self-contained "smart" DBS system. "With the stimulator and detection, we can create algorithms and then raise neurotransmitters to a specified level," says Kevin Bennet, a Mayo Clinic engineer who helped create the system. "We can raise these chemicals to appropriate levels, rising and falling with each person throughout their life. Within milliseconds, we can measure, calculate and respond. From the patient's perspective, this would be essentially instantaneous."